A few weeks back, I ran across a link on BoingBoing to an article on Slate.com. I saw that it mentioned old documents and since I’m a sucker for old documents, I gave it a read. 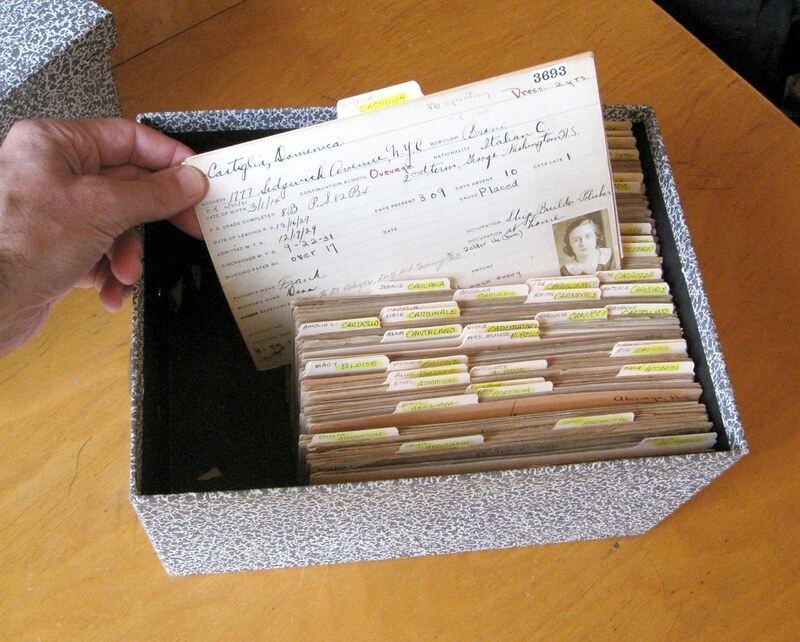 If you’re also a fan of old documents, especially more interesting ones, than you’ll love this series of articles on a collection of old report cards and how the author used them to not only tell the history of these people, but to even connect them back to their descendants. Four hundred little dramas, all sketched out on cardstock. Marie’s report card comes from a large batch of old Manhattan Trade School student records that I stumbled upon more than a decade ago and have been obsessed with ever since. I’ve spent a good chunk of my life poking around antiques shops, yard sales, and abandoned buildings, but these report cards are by far the most evocative, most compelling, and most addictive artifacts I’ve ever come across. This sounds like something I would do if I ever ran across a batch of old documents. I’ve learned in the last decade of family research that sometimes you can find the most compelling information in your non-standard documents. “Non-standard” being something other than things like census or vital records. Not only do these records give you more information, sometimes they tell you stories. I personally find that stories make your ancestors seem more alive. More than just names and dates. To anyone interested in history and even family history, I recommend reading his articles. He wrote (as of right now) 5 articles relating to these documents, so make sure you have some time. 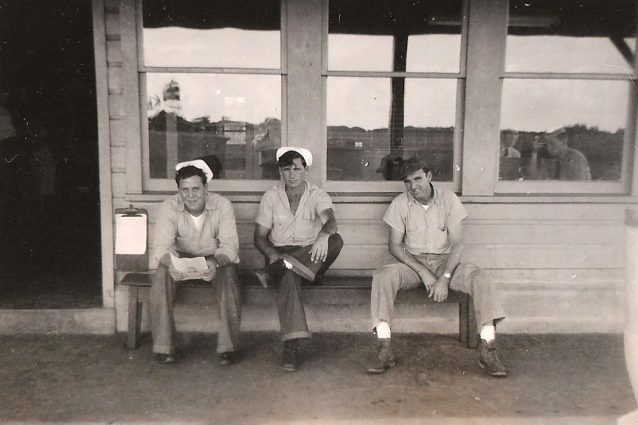 This database contains U.S. Navy muster rolls and associated reports of changes for U.S. Navy enlisted personnel who served on U.S. Navy ships or in other naval activities between 31 January 1938 and 31 December 1949. Over 33 million records are contained in this database. I ran a search on my grandfather and found many records. Most of them don’t contain any surprising information, but they can be used to track his movement through the Navy during WWII. He is first found on 31 Jan 1941 at the U.S.S. Naval Air Station in Pensacola, Florida. 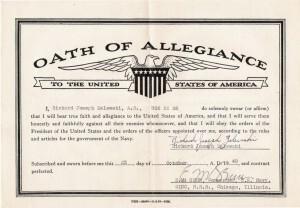 It says he enlisted in 23 Oct 1940 in Chicago, which is close to his hometown of Milwaukee. His “rating” at this time is listed as “AS,” which in naval terms stands for Aviation Support Equipment Technician. 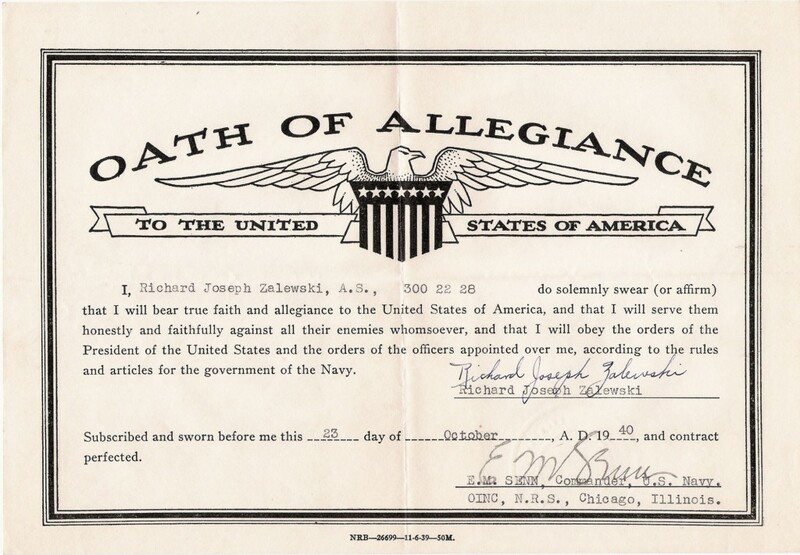 It also notes on the page that he transferred from US NTS (probably Naval Training Station) Great Lakes, Illinois. The next listing on 31 May 1941 has two entries. The first entry is from Pensacola which mentions that he was transferred to the NAS (Naval Air Station) in Miami, Florida on 23 May 1941. The next entry is from Miami stating that he was received from Pensacola on 28 May 1941. He is again listed in Miami on 30 Jun 1941, though no changes were made, still a Seaman 2nd Class. His next change in rating came on 1 Jul 1941 at Miami, written as “to Sea1c. AUTH: BuNav Cir.Ltr. No. 27-41 corrected by BuNav Cir.Ltr. No. 66-41.” Not sure what all of that means, but he did get a promotion somewhere in there. He is still a Seaman 1st Class on 30 Sep 1941. According to Wikipedia, Sea1c is now called Petty Officer Third Class. On 1 Dec 1941, Richard gets his next promotion from Sea1c to AMM3c, which during WWII stood for Aviation Machinist’s Mate, 3rd Class in his case. They were responsible for “maintaining aircraft engines and their related systems, including the induction, cooling, fuel, oil, compression, combustion, turbine, gas turbine compressor, exhaust and propeller systems” and many other things. The last muster roll entry for Miami is on 31 Mar 1942 where he is still listed as an AMM3c. There are two entries I also found on ships that are more than likely my grandfather. The “Service Numbers” on the entries match up from the earlier entries. I know the earlier entries were him due to records and photos I have. Though, he never saw combat, he may have been on a ship while it was docked in America. The first entry was on the USS Orizaba on 10 Jul 1944. Though, the ship is listed as travelling from San Francisco to “FRAY.” I’m not sure what “FRAY” is. This matches up with the history of the Orizaba as it says, “Back at San Francisco in June , she underwent repairs; completed a run to the Marshalls and Marianas; and then sailed north to the Aleutians.” He is now listed as AMM1c, so he has been promoted to 1st Class since 1942. The next and final entry I have found was for the USS Shangri-La on 1 October 1946. Again, the “Service Number” matches and this record matches up with the historical record of the ship, “she made a brief training cruise to Pearl Harbor, then wintered at Puget Sound Naval Shipyard.” He is still rated as an AMM1c. This entry contains some information that I can’t quite figure out at the moment. I’ve browsed through the whole muster roll and can’t find explanation of the abbreviations and acronyms they’re using or what the columns mean. USS Shangri-La, 10 Oct 1946. Ancestry.com. U.S. World War II Navy Muster Rolls, 1938-1949 (database on-line). The first entry may mean something like “For Further Transfer (FFT) Work Completed (WC) Discharge (DISCH)” I know he finished his naval work in 1946. Maybe this was the ship he took from Pearl Harbor back to the contiguous 50 states after serving in Hawaii. While I was aware of a lot of my grandfather’s navy duties during WWII, it’s neat to see them written in government documents. Though, there is no information from his time spent in Hilo, Hawaii from which most of the photos I scanned a put online were from. 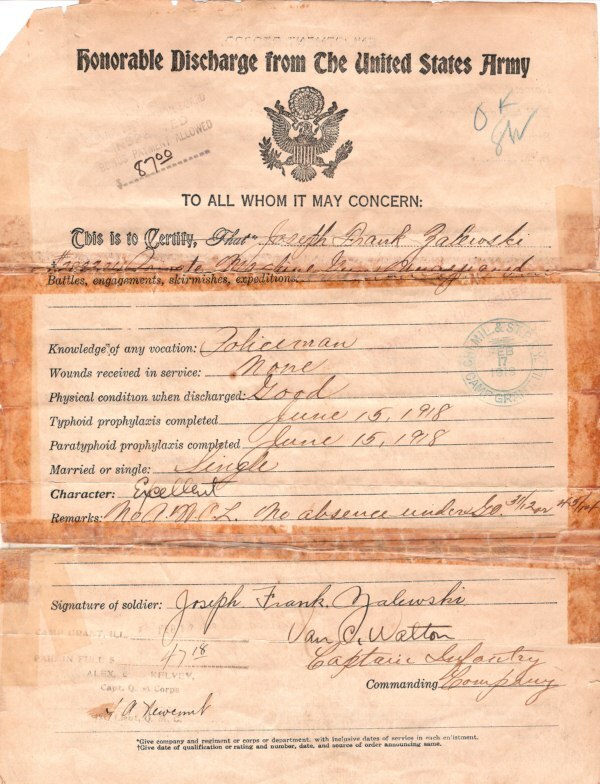 While looking for some other documents, I ran across a record that again pretty much seals the fact that my great-great-grandfather, Frank J Zalewski, and the Jacob Zalewski I have been researching were brothers (or worst case, cousins of some sort.) 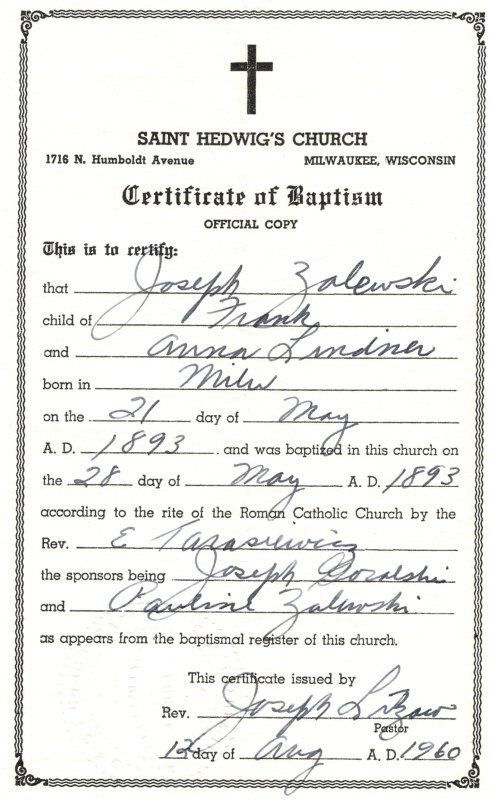 Below is my great-grandfather, Joseph Zalewski’s, “Certificate of Baptism” from St. Hedwig’s Church in Milwaukee. 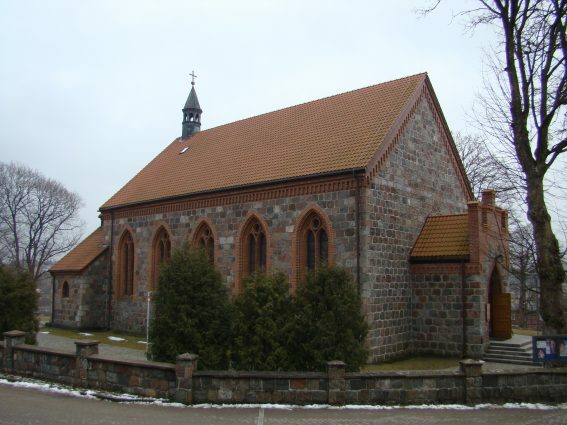 The document itself is from 1960, but the information is probably taken directly from the church’s records. The part that interested me on this specific item was the list of “sponsors.” It lists Joseph GORALSKI and Pauline ZALEWSKI. Joseph has been mentioned a lot recently along with the GWIAZDOWSKI’s. Pauline is Jacob’s wife and probably Joseph’s aunt. Mary may also be Joseph’s aunt, if her obituary is to be believed. I have a bunch of military documents, so I thought I’d put up some posts in the Military Monday theme. 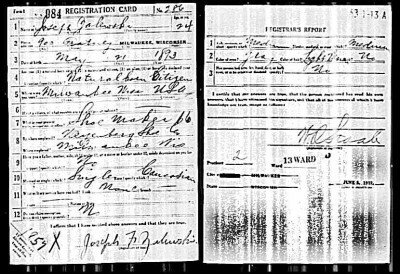 This the WWI Draft Registration for my great-grandfather, Joseph Zalewski, who did end up participating in the war overseas. 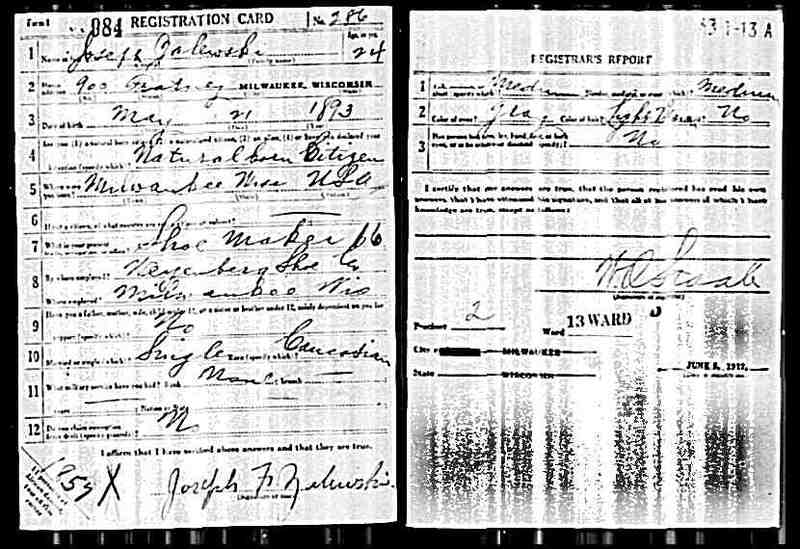 Joseph registered on (I think it says) June 5, 1917 at the Ward 13, 2nd Precint draft office in Milwaukee, Wisconsin. At the time, he was 24 years old, having been born on 21 May 1893 in Milwaukee. He was living at 900 Fratney Street, which is where his parents also lived. His occupation at the time was a “Shoe Maker” at Weyenberg Shoe Co. in Milwaukee. He was not yet married. According to the document, he had “gray” eyes and “light brown” hair. 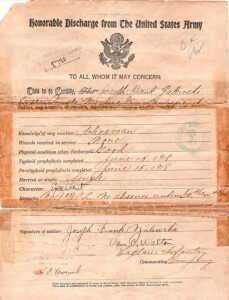 "World War I Draft Registration Cards, 1917-1918," digital images, Ancestry.com (http://www.ancestry.com: accessed 23 March 2008), Joseph Zalewski, order no. 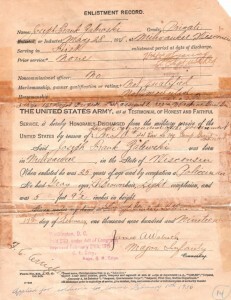 286, Milwaukee, Milwaukee County, Wisconsin; citing World War I Selective Service System Draft Registration Cards, 1917-1918, NARA microfilm publication number M1509; roll 1674886. I thought I would write a post on how to convert one of your ancestor’s Land Records into an actual physical location. Right now, I only have the information on how to do this in Wisconsin with the resources that they have available. Other states may have these items available too. Your mileage may vary. I have Wisconsin Land Records for two of my ancestors, Mathias FIRMENICH and Jean Baptiste LAURENT. I will use Mathias’ Land Record for this example. You can view his Land Record on my Mathias site’s “Land Purchase” entry. 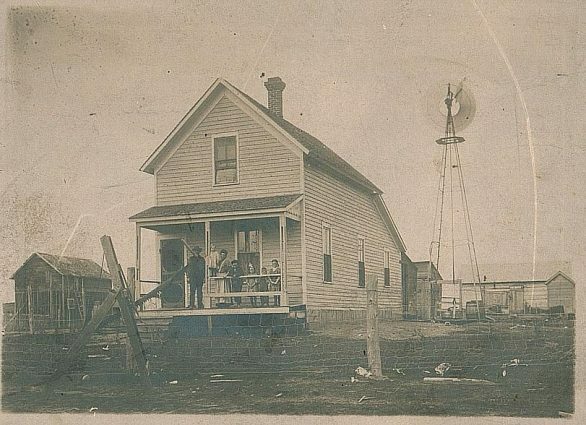 ..the claim of Mathias B. Firmenich has has been established and duly consummated in conformity to law for the southeast quarter of Section 18 in Township 46 north of Range 4 west of the 4th Principal Meridian in Wisconsin containing 160 acres. To most people, this just looks like gibberish. It did to me at first. I knew what it meant, but I had no idea where to even start to look for it. 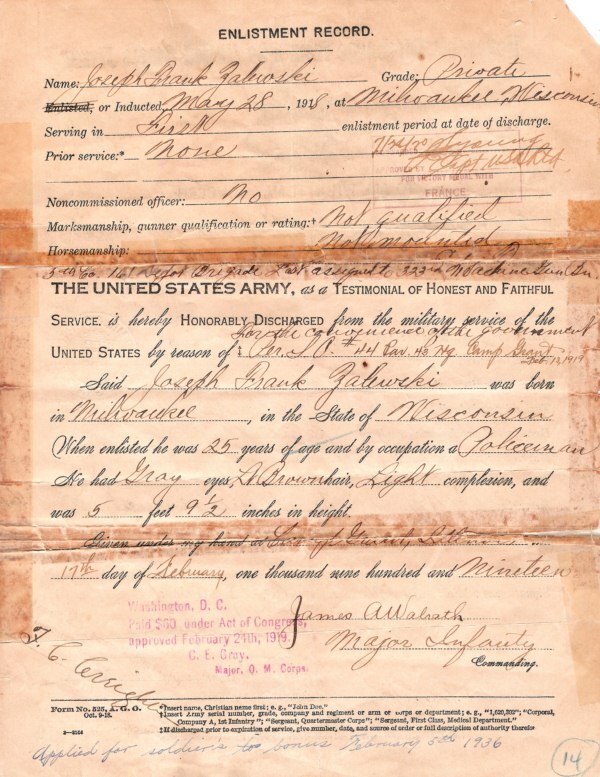 One of the big mysteries I am trying to solve in my genealogy is to find more information on my great-grandfather, Joseph Zalewski’s, military history. According to a previous family researcher, all of his military files were burned in the extremely destructive 1973 National Personnel Records Center fire. So, all the information I had was that he served in World War I, possibly in France at some point. By sheer luck, during a random Google Books search, I found him listed in a book about the 86th Division headquartered at Camp Grant in Illinois. From there I was able to determine that they were shipped to France in 1918, but never saw combat due to the Armistice. Though, it did mention that a lot of the division was broken apart and used in other divisions at the time. I did a more in-depth post about this find about a year ago. 5th Co. 161 Depot Brigade. Last assignment to 323rd Machine Gun Bn. Unfortunately, it looks as though the previous line may be missing, but I do now have more information on where he may have went after the 86th Division broke apart. I have yet to find much information on the 323rd Machine Gun Battalion, which looked to be part of the 83rd Division. I mostly find information on Ohio, since it looked to be originally stationed there. Here are the two documents. Click the for larger versions. Thank you to all of those who have served our country and who are currently serving our country. Special thanks to the veterans in my family: My grandfather Richard Zalewski (WWII), my grandfather LeRoy Thielke (WWII), my great-grandfather Joseph Zalewski (WWI), and my 3rd-great-grandfather John Last (Civil War). I have found what I think is the passenger list for my 4th-great-grandparents (found via my 3rd-great-grandfather, Mathias FIRMENICH.) They had it transcribed as Fermainz, which is does look like, but I can see FIRMENICH in it also. Now, a lot of things match up. 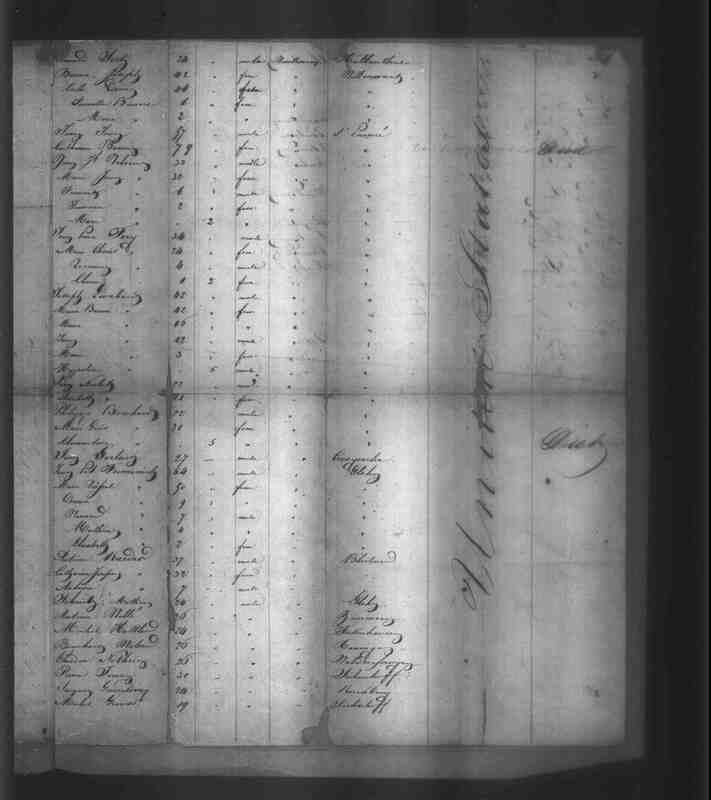 The list is from April 22, 1847, which is when this family supposedly immigrated according to multiple obituaries, etc. The father is listed as Pet. Firmenich, male, 54 – My Peter is listed as being born in about 1792, which matches up. 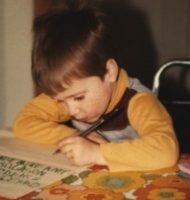 Son, Mathias, is listed as Mathias Firmenich, male, 4 – I have records of Mathias being born in 1843, so this matches, too. Daughter, Elizabeth, is a listed as Elizabeth Firmenich, female, 2 – According to some newly found information, this also matches up as I have an Elizabeth born about 1845. Now, I’m lost on a few of the other entries. The wife is listed as what looks like either “Marie” or “Vorpal.” Peter and his wife both have another word before their names, which I can’t make out. 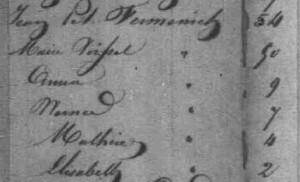 I’m only assuming it means either “Husband” or “Father” or something similar since I seem to see it on other families in the list, which would make his wife listed as “Vorpal.” According to Mathias’ marriage record, his mother is listed as Anne Marie TURSELL. I have yet to find her in the census records since I can only find the family in 1860+ and she is not listed. Though, I’m pretty sure she made the trip since they have another son in Wisconsin in 1849. I also don’t have records of their first two children, daughters Anna and another name I can’t read. Though, their ages would allow them to have been married and gone by the time I found them in the 1860 census, so those are completely possible. I also can’t make out what I think is the home location. It looks like it says either “Glehy” or “Glihy.” It is also listed for another individual lower in the list. One thing that stuck out is that the “G” on that word doesn’t look much like the other G’s they’ve written, so I don’t know if it’s a G or not. Is there anyone out there that has some talent at transcribing old German handwriting? Though, this may possibly be in Belgian/French since the port was Antwerp, Belgium. Maybe even another set of fresh eyes will help. The full image is linked below. Thanks. [ FULL IMAGE LINK ] – Listing is about 75% down the page.